Dileno Lopes made his mixed martial arts debut in 2007 at just 18 years old. Lopes quickly established his top prospect status as he submitted his way through his first 8 opponents. Lopes’ talents nearly earned him a contract stateside to compete in Tachi Palace Fights against Ian McCall, but talks fell apart and Lopes was resigned to continue competing on the Brazilian regional scene. 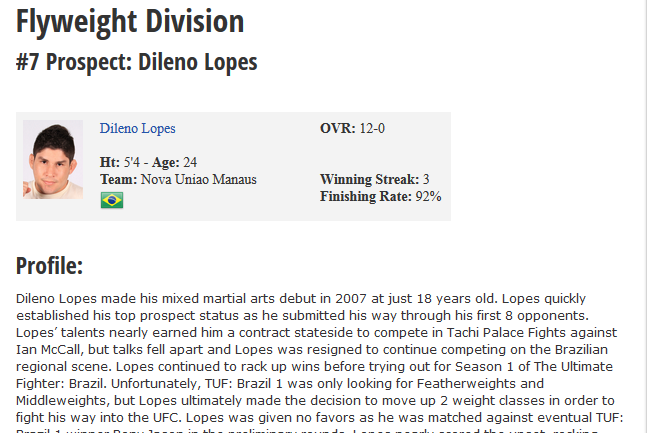 Lopes continued to rack up wins before trying out for Season 1 of The Ultimate Fighter: Brazil. Unfortunately, TUF: Brazil 1 was only looking for Featherweights and Middleweights, but Lopes ultimately made the decision to move up 2 weight classes in order to fight his way into the UFC. Lopes was given no favors as he was matched against eventual TUF: Brazil 1 winner Rony Jason in the preliminary rounds. Lopes nearly scored the upset, rocking Jason with strikes early, but despite a valiant effort, Jason was able to storm back and finish Lopes with strikes in the 1st round. Lopes was once again forced back to the Brazilian regional scene, where he racked up three 1st round submission victories in 2012. Lopes was supposed to face fellow TUF: Brazil 1 contestant Giovanni Santos, but Lopes pulled out of the fight last minute due to injury. Lopes trains out of Nova Uniao Manaus, which is not home to the famed list of alumni that surrounds Nova Uniao’s headquarters in Rio. Lopes likely has trained alongside the beasts at Rio’s Nova Uniao, but he may not enjoy the same benefits that Head Coach Andre Pederneiras provides his fighters, which are connections to bigger promotions and opportunities to fight overseas. Lopes has only fought for Shooto Brazil once in his career, which is Nova Uniao’s dedicated promotion. He has primarily fought on fight cards located around the Amazonas area. Unfortunately, this region does not gain the mainstream attention that Brazil’s top promotions; Jungle Fights, Shooto Brazil, or Bitetti Combat receive. Lopes is ultra-aggressive and that style will likely catch the eyes of the UFC and Bellator. The UFC already thought he had the talent to try out for The Ultimate Fighter, but the problem was Lopes was forced to fight 2 weight classes above his natural weight class. Lopes may jump at the chance to sign with Bellator, though he would be forced to compete as a bantamweight. Lopes is UFC-ready. His skill-set has already proven to be dominant on the Brazilian regional scene. Though Lopes has never really faced any big-name competition besides Rony Jason, his performances thus far have spotless. Should Lopes sign with the UFC, he would be an instant crowd pleaser. Although, Lopes has won most of his fights via submission, he has proven his willingness to swing for the fences. 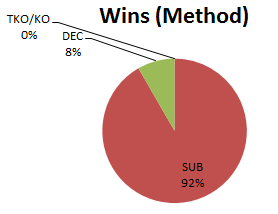 Lopes may not have the wrestling pedigree of many of the UFC’s current flyweights, but he does bring a stellar top game, and has a stocky build that should allow him to hold his own in the strength department. Lopes is still just 24 years old, but the time is now for him to compete against the UFC’s best flyweights in the world.